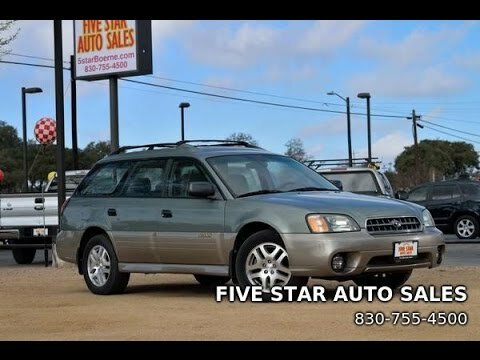 Subaru legacy with all-wheel-drive: a reliable car with excellent gas mileage. I love my Subaru legacy. My favorite feature is the all-wheel-drive. It rides really well in rough weather. The steering wheel has a nice handling feel to it and accurate to the touch. It also has cruise control for longer trips on the highway. The gas mileage is excellent, I fill my tank once per month. It gets me to all my local town and surrounding area physician's appointments, so I never have to worry about missing an important health appointment due to lack of fuel. I have my oils changed regularly on schedule, so I have never had any issues with the motor, thus far. The heat works well and never have any defrosting issues. It is an easy car to keep looking and running in very good condition. I would purchase another Subaru legacy in the future. Everyday life in a Subaru. 2003 Subaru legacy 2. 5 gt haven't had many problems I am believe I am the 3rd owner 190000 miles going strong, usual Subaru head gasket issue was the only problem. It has been nothing but reliable the same as every Subaru I have owned. Sunroof, heated seats, comfortable setup, the seats could definitely use some more cushion, after about 100 miles into a trip the become very uncomfortable but the quality of the ride is great. The safest, most affordable option for a Michigander looking to survive winter. I drive a Subaru legacy, luxury model. Though the car is a smaller sedan with a smaller engine, it gets decent gas mileage and four wheel drive makes it essential in the winter. The interior is high quality, with carpeted floors and seats. The dash is a mixture of black leather with faux wood overlay. The stereo is fairly outdated and lacks an auxiliary input. On certain passenger and sport utility vehicles, the cruise control cable could come out of its track on the cruise control lever and lodge on the control lever tab when the accelerator pedal is released. If this condition occurs, the throttle will not return to the idle position and will remain in an open position. If this occurs during vehicle operation, the driver could lose control of the vehicle, which could result in a crash. Dealers will install a cruise control cable retaining clip to the cruise control lever tab on the throttle shaft in order to prevent the cruise control cable from coming out of its track.